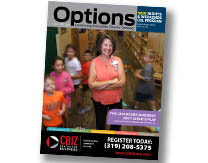 Download a PDF of our recent Options course catalog. The Options course catalog offers classes for individuals seeking a fun hobby, new skills, or educational tools to improve their business. The Options catalog is distributed periodically throughout the year with new courses available in the fall, spring, and summer. Click here to complete the online mailing form to receive The Options course catalog at your doorstep. Stay connected with weekly email updates on upcoming classes. E-mail cbiz@scciowa.edu to be added to our e-mail list.